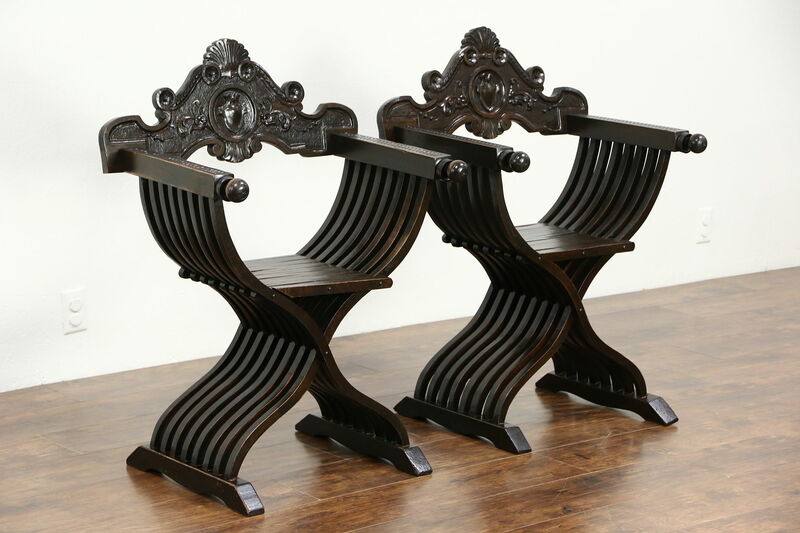 A pair of classic Italian "Savonarola" folding chairs are named after the fiery monk of Florence, who railed against the profligacy of the wealthy city. This antique furniture was hand carved of solid wormy walnut in the 1890's, and the backs have a deeply sculpted family crest or coat of arms. The original finish is very well preserved with just enough wear for a little character, and was protected with fresh varnish. Traditional carved wooden rings to hold a family pattern scarf at outdoor festivals and the famed horse races are original. Measurements are 28" wide, 20" deep, 38" tall and the seats are 19" high.